The L-shaped Vidalakis Residence in California is a spacious daylit residence that cradles a 75-foot-long infinity pool. Its glass facade encased in timber frames provides a generous amount of natural lighting and follows the circulation spine that ascends along the sloping terrain. The building was designed by Swatt Miers Architects, who are experienced with designing nature-embedded retreats. The elongated house rises from the sloped terrain of a 3.7-acre parcel in Portola Valley in California. The 7,000-square-foot home houses all its private and public spaces on the north side and offers long and lovely views of the rural surroundings. Large windows in the double-height living room bathe the space in natural light and, thanks to the vertical frames, create a nice pattern that travels through the space during the day. The interiors feature custom details and decoration, along with natural materials and patterns that reference the envelope frames. Framed by the shape of the house, the large swimming pool features three infinity edges and reflects the landscape. It creates a private area illuminated by discreet artificial lights at night. 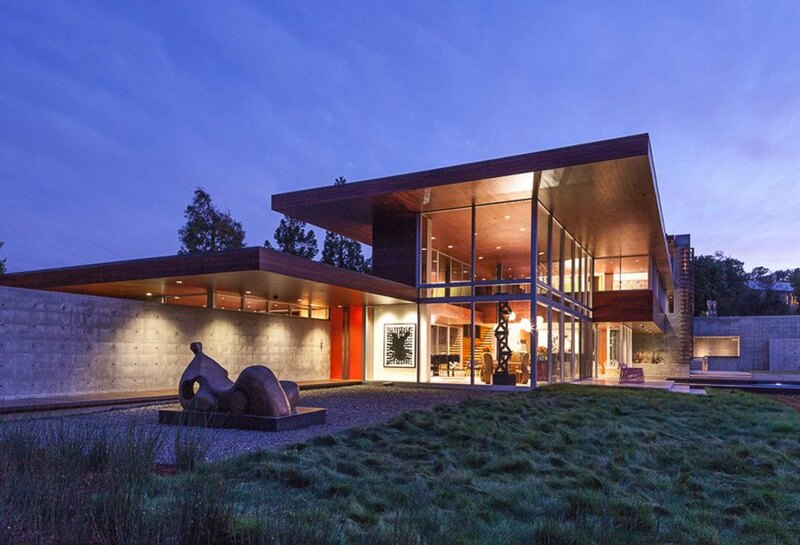 The elongated house rises from the sloped terrain of a 3.7-acre parcel in Portola Valley in California. The 7,000-square-foot home houses all its private and public spaces on the north side and offers long and lovely views of the rural surroundings. Large windows in the double-height living room bathe the space in natural light and, thanks to the vertical frames, create a nice pattern that travels through the space during the day. The interiors feature custom details and decoration, along with natural materials and patterns that reference the envelope frames. Framed by the shape of the house, the large swimming pool features three infinity edges and reflects the landscape. It creates a private area illuminated by discreet artificial lights at night.